The molecular mechanisms underlying folding of mammalian chromosomes remain poorly understood. The transcription factor CTCF is a candidate regulator of chromosomal structure. Using the auxin-inducible degron system in mouse embryonic stem cells, we show that CTCF is absolutely and dose-dependently required for looping between CTCF target sites and segmental organization into topologically associating domains (TADs). Restoring CTCF reinstates proper architecture on altered chromosomes, indicating a powerful instructive function for CTCF in chromatin folding, and CTCF remains essential for TAD organization in non-dividing cells. 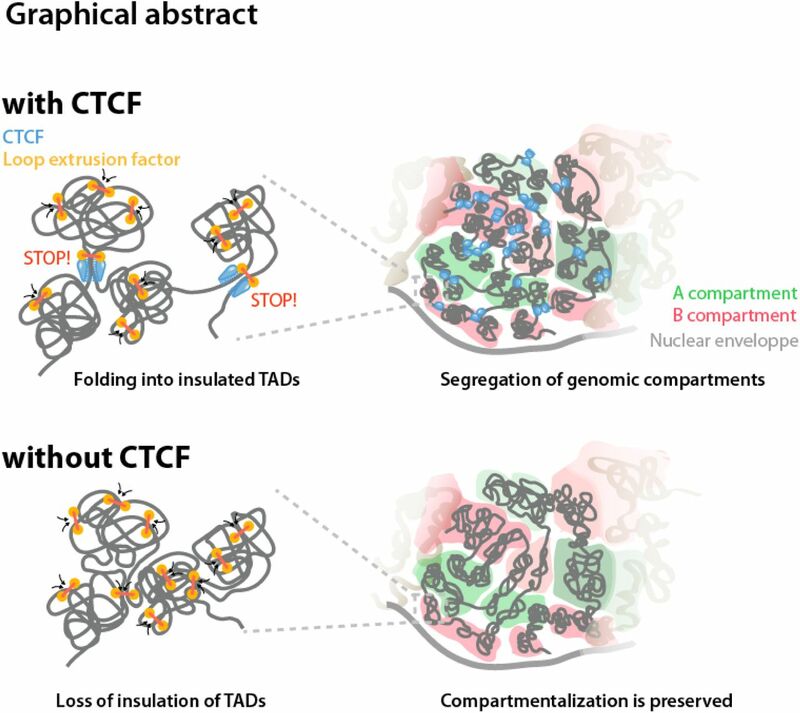 Surprisingly, active and inactive genome compartments remain properly segregated upon CTCF depletion, revealing that compartmentalization of mammalian chromosomes emerges independently of proper insulation of TADs. Further, our data supports that CTCF mediates transcriptional insulator function through enhancer-blocking but not direct chromatin barrier activity. These results define the functions of CTCF in chromosome folding, and provide new fundamental insights into the rules governing mammalian genome organization.